Fun Fun Fun Fest is designed to be a smaller festival than its 65,000-capacity counterpart, and that just makes things more pleasant during the day. It also means you don’t have to worry about your reception completely blowing out during the day. Even if you don’t have AT&T! Plus, unless you’re one of those determined stagemobbers, you can enjoy some elbow room in Waterloo Park. The festival is well-proportioned, with the biggest acts bringing in what might be midsize crowds at ACL Fest. The size also means you can see the band members’ faces, even from the back of the crowd. FFFF borrowed the booking model from Pitchfork Fest, and – let’s face it – Austin totally needed a Pitchfork Fest. In a town already inundated with music, Fx3 Fest actually makes it easier to get people seeing bands. That’s another thing we liked: On Stage One, for instance, six of the 11 bands could call themselves Austin bands. Two, though, were Okkervil River and Explosions, so we’ll let you decide whether they count. 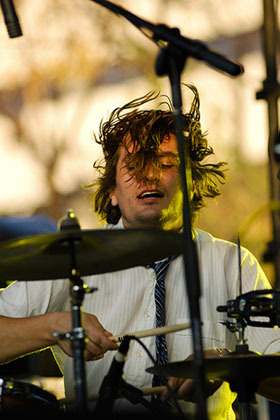 We especially liked White Denim – dumb name, good band – who dished out the rawest rock the indie-pop stage could handle. The stick fell right out of the drummer’s hand and he kept it going. Rock ’n’ roll! And The Lemurs, despite playing to about five people, opened up Stage One in spazzy, synthy style. Meanwhile, on Stage Three, DJs Manny and Bigface of Austin’s own DJ Dojo got the hip-hop and dance crowd pumped. Waterloo Park is a few blocks east of the Capitol and a helluva lot closer than Zilker. The other thing about Waterloo, like we said earlier, is that it’s small. So you can walk across the whole thing in about a minute and a half. It’s especially convenient if you’re stagehopping or checking out new acts. 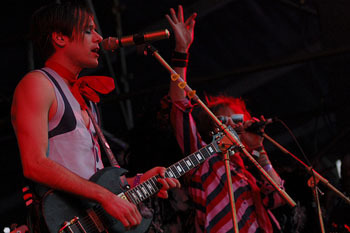 Two of the band’s supporting acts on the tour played on Stage Three. MGMT took longer than expected to set up. The festival probably thought they were going to perform as a two-piece, not realizing that MGMT was now a full, five-piece band. The additions were worth it, though, because this band’s rhythm section shines. Listening to the band’s MySpace doesn’t even do justice to how great they sounded live. It’s lush, thoughtful psychedelic rock, which is great, ’cuz a lot of psych-rock is kinda dumb these days. And then there’s Grand Buffet. When this white hip-hop duo from Pittsburgh, Pennsylvania performs, prepare to be assaulted by a full-force lyrical hurricane. If you divert your attention for even a moment, you will be crushed beneath their witty, satirical, hip-hop bulldozer. Their wordplay skill was only matched by the catchy beats spun by their current touring DJ, Austin’s very own DJ Jester the Filipino Fist. The Fest is divided into three stages: Stage One is indie-rock/pop, Stage Two is punk and other heavier music, and Stage Three is dance/electronic music. Stages One and Two are split stages, which means that instead of having to walk from stage to stage or spend an hour sitting in silence, you can stay at your stage of choice and enjoy continuous music throughout the day. Brilliant idea, folks. I think the set-up is partially responsible for the crowd’s energy throughout the night. No burnout here. Any band that got a good-sized crowd fed off the energy. The New Pornographers, for example, really turned it on tonight. I saw them in Houston on Thursday, co-headlining with Spoon, and the front row was populated by aging hipsters imported from 1997. They just looked angry and bemused the whole time. Even though they put on a good show that night, The New Pornos seemed a little troubled by the lack of response. Tonight, though, with a totally-into-it crowd, the rockers crackled and the ballads soared. The four-part harmonies were spot-on, even with the usual festival sound troubles. The lead singers, Carl Newman and Neko Case, fed off the energy both with the gusto they put into the songs and with the stage banter. About halfway through the set, they mockingly demanded Rice Krispies Treats from the Spider House concessions booth. “An entire loaf of Rice Krispies Treats, at once!” Neko demanded. Carl uttered, for what may be the first time in the record of human linguistics, “What part of ‘loaf of Treats’ don’t you understand?” It was silly, but silly works for the band. They looked like they were having a party on stage, and that’s why I love them to begin with. Thank you for not choosing to host a music festival in September. Really. The weather was perfect today. 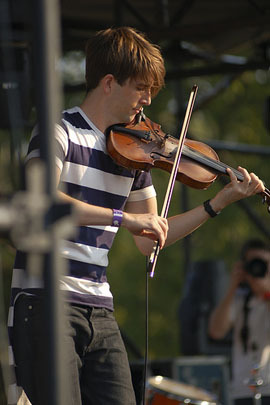 Sort of like how Andrew Bird drew an unexpectedly large crowd at ACL this year, Fun Fun Fun’s own king of loop pedals, Final Fantasy (also known as The Dude Who Played Violin for The Arcade Fire) was the midday hit. He took issue with the “Christing sound problems,” but everything came together after he mustered up the balls to cover a Destroyer song, “An Actor’s Revenge,” while Dan Bejar, Destroyer himself, was hanging out backstage. Just when he finished, Dan showed up on stage, and so they decided to play the song again, as a duet. We also enjoyed Emma Pollock, who used to play in a band called The Delgados. She’s also Scottish. And tiny. She plays pretty, melodic pop music that’s worth checking out, and it’s even more entertaining than her awesome accent and her band’s perennially high drummer. Chances are you’ve never heard of hip-hop artist Busdriver and you probably never will. His fast-paced, discordant rapping style is a distant cry from vanilla mainstream rap. But just because you can’t sing along doesn’t mean he can’t throw a few accessible head bangers to the crowd. To get acquainted with Busdriver, check out “Casting Agents and Cowgirls” and prepare for a lesson in hip-hop that dares to be different. Aaron Stanush contributed the sections on Grand Buffet and Busdriver.